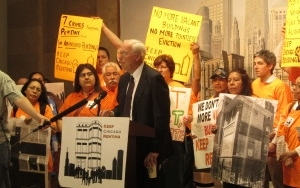 LSNA leader Daniel LaSpata at a Keep Chicago Renting Coalition press conference in City Hall. The Keep Chicago Renting Ordinance will keep Lease-compliant renters in their homes following foreclosure and prevent vacant bank-owned foreclosed rental buildings. Ordinance is now in effect. If you are a tenant and you live in the Avondale, Hermosa or Logan Square neighborhood area give us a call at 773 384-4370 and ask for Marcelo or John.